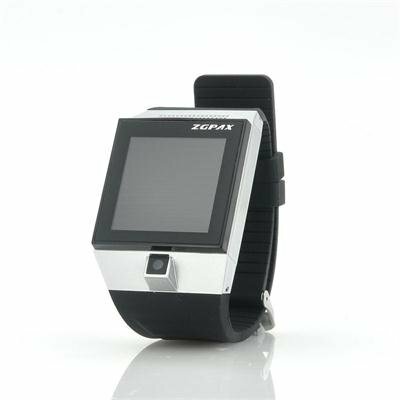 Successfully Added ZGPAX S5 Android 4.0 Smart Phone Watch - 1.54 Inch Capacitive Touch Screen, Camera, Dual Core CPU (Silver) to your Shopping Cart. Android Smart Watch with 1.54 Inch Touch Screen, Camera, Dual Core CPU and more. Wear Android around your wrist. Introducing Chinavasion’s first Android 4.0 Smartwatch, the ZGPAX S5. Combining the functionality of a phone with the portability of a watch, the ZGPAX S5 is the perfect replacement for your phone. Boasting a 1.54 inch touch screen, all text input and navigation is done directly on your wrist and even making a phone call doesn’t require extra accessories. Just insert your SIM card and enjoy the freedom of a watch phone. No more misplacing your phone or digging in your bad to find your phone when a call comes in. The interface of the ZGPAX S5 is easy to use and running on Android, all the options you are used to have on your phone will also be available on this smart watch. 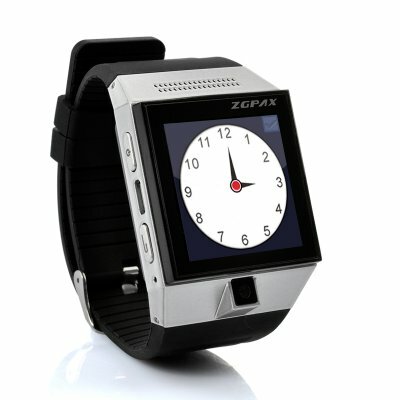 Even installing apps is possible making the ZGPAX S5 a fully fledged 21st century watch. Not much bigger than a regular watch, this phone is as powerful as a full sized Android phone and features a Dual Core CPU making sure every action is completed lag free. On top of that, 4GB of internal memory will be at your disposal on which you can save all your multimedia. Connect to a Wi-Fi network to browse the web, pair the ZGPAX S5 through Bluetooth with another device or even use the GPS function to find your way around the city, all from your wrist. The soft silicone strap design makes the ZGPAX S5 comfortable to wear and can adjust to the wearers wrist for an optimal user experience. Coming with a built in Accelerometer, the screen will automatically adjust to the direction it is held in and naturally, the ZGPAX S5 can also be used as a regular watch which displays the time with just a press of a button. Enter the world of smart watches today and order the ZGPAX S5 now. In stock, this phone watch can be shipped to you within one working day and comes with a 12 months warranty. Brought to you by theleader in wholesale Android smart watches, Chinavasion. convenient but for my purpose the display is too small. All function, no problem for now. Good price for a product. Fast and mobile product! Just as I expected! Very good product. Easy and light. ans it is not ugly. This Smart Phone Watch is really cool. Bright colorful display. Fast processor and sensitive screen.